There is hope in these days of winter because the nights get shorter and the days get longer. The sun rises earlier each morning and stays up longer each night and the light lets us know that Spring and Summer are coming. As Jesus preaches and teaches in Galilee, the light of God shines in dark places. The prophecy comes true which said, "The people who lived in darkness have seen a great light." In today’s Gospel we find Jesus by Lake Gennesaret, also called the Sea of Galilee. The people are crowding around Jesus to hear the Word of God. Jesus is teaching the people that He is the promised Messiah, the Son of God sent to save God’s people. The crowds are pressing in on Jesus to hear the Good News and Jesus sees two boats nearby that had fished all night and caught nothing. What happens next shows how the light of Christ will continue to shine in this world until the last day. Jesus gets into Simon Peter’s boat and has him push out a little from shore and Jesus sits down and uses the boat as His pulpit to preach to the crowds gathered on the edge of the water. Afterwards Jesus tells Peter to go out into the deep water and lower his nets. Peter protests that they worked all night and caught nothing, but because Jesus said to do it, they will do it. And you know what happens next. 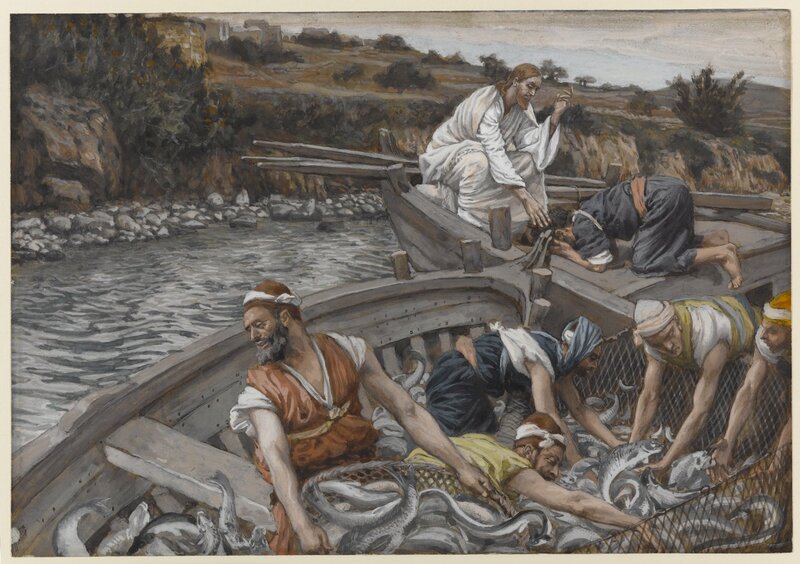 As they pull up the nets they are so full of fish they began to break and Peter and his crew have to call to another boat to help with the great catch. There are so many fish that both boats are ready to sink. We can learn from this miracle. Through the centuries Christians have come to associate the details of this story with the way the faith spreads throughout the world. The sea represents the world, the fish, people; men, women and children. The net and the hands that lower it is the preaching of the gospel of Jesus Christ, and the boat is God’s Church, the gathering place of his people caught by the gospel. This shows us that Jesus intends the world to come to him through the preaching of his gospel. As the net of his word is drawn through this world, people hear the voice of God and are caught alive. They are brought from their hiding places in the depths up to the light of Jesus himself. They come to see him as their savior and are brought into his kingdom to live. When Peter sees this miracle of fish he is overwhelmed. He too has been caught up in the net and brought into the light of Jesus. But the light shows some things about Peter that he would like to keep hidden. Peter is right. He is the kind of fish that stays at the bottom; out of the light but Jesus loves this bottom feeder, and has use for him. God still has use for Isaiah and he purifies Isaiah’s lips so he could speak the secrets of what he saw. When you come to the realization, like Peter and Isaiah, of how short you fall in obedience to God, you can be overwhelmed with grief and despair. But God purifies you as you are drawn into his presence. His word to you is forgiveness. It gives you new life, a new reason for living. "You are forgiven," says Jesus. When God’s word shines upon you, you can have the same reaction. Being brought into the light of Christ exposes parts of your life you don’t want exposed. We recognize this each week as begin worship. When we begin the Divine Service we invoke God, “In the name of the Father and of the Son and of the Holy Spirit.” What do you do next? You get on your knees and plead guilty of being a natural born sinner who is unworthy of God’s love. And yet God loves you anyway. Jesus forgives Peter with the words, "do not be afraid, from now on you will catch men." Peter is in Jesus’ net, brought to the surface and exposed to the sun’s light, but he will live forever. God will use Peter to fish for men. For twenty centuries the fishing has gone on. People have become hearers of the word through the preaching of the word of Christ, how he died to remove our unworthiness. The light continues to shine in every place as the preaching goes on. People are united with Christ in the washing of baptism, and he visits them in the Lord’s Supper to sustain their souls. The light continues to shine today as we are brought out of the darkness by Jesus’ net to live in the light, and like Peter, to fish for men. We fish for men when we invite others to hear the word of God among us. When we teach the children, guide the teenager, strengthen the family, comfort the sick, and console those who mourn the death of loved ones. There is a story of a young man who used to pick up hitchhikers in the days when it was safe to do so. One young man he gave a ride to who asked what the man did for a living. "I’m a sort of salesman," he said. "What do I sell? Only the greatest product in the world. Everyone needs it. Do I make a lot of money? Oh no. I give it all away. Would you like a sample?" You see, this man was a minister to the deaf. He drove the highways of northern Wisconsin catching souls, bringing light to people who lived in darkness. The miracle of bringing fish into the boat is the miracle of bringing the bottom feeders up into the light. It is making the unworthy sinner fit to stay in the presence of the holy God. It is the miracle of the forgiveness of sins. Not only does Peter receive the forgiveness of sins, but he will be catching men alive and bringing them into God’s boat; the church. He will lower the net by preaching about Jesus Christ. He will declare the kingdom and bring them into that kingdom through preaching about Jesus’ work, through baptism and the Lord’s Supper. Catching souls for Jesus is not only Peter’s work. All of you share in his work by hearing the word, by being a part of this congregation, by bringing your families, by the sacrifices you make in order to bring an offering today out of the thankfulness in your heart. Thankfulness to God for the net of the gospel that has pulled you out of darkness and hoisted you into the light of God’s boat. Most importantly, you continue in the fishing for men by your witness to the word of God, the light of Galilee. By your words to a friend, "Is there something I bring to God in prayer for you?" By your readiness to explain the faith in your own way. To tell how Jesus brought you out of darkness and into eternal light. It is tempting to think that your career, your family, your enjoyment is the most important thing in your life’s journey. But, we know that the work of God, fishing for men, is the ultimate reason God keeps us in this world. We’ve wasted enough time. There are so many fish in the deep sea, but God has given a strong enough net in the word of Christ, and a big enough boat in the Christian Church, to accommodate all who will believe. Through the Church of Jesus Christ, the light is shining on those who live in dark places. The light has shined on us and revealed us to be the forgiven and restored children of God. God calls us to offer this light to the whole word, starting right here. Amen.